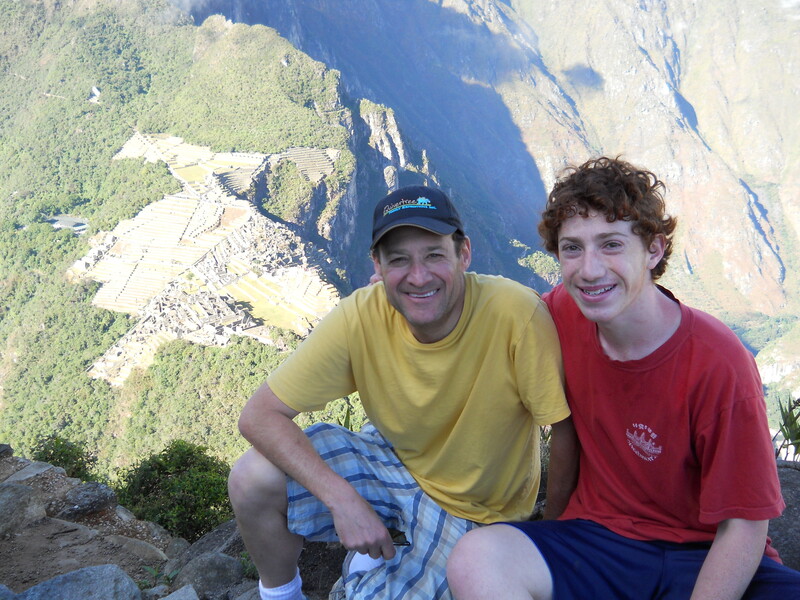 Recently I had the privilege and pleasure of climbing Huayna Picchu with my son, Ilani. As he is almost 16 and in very good shape, I was grateful for the years of exercise and running I have put in! 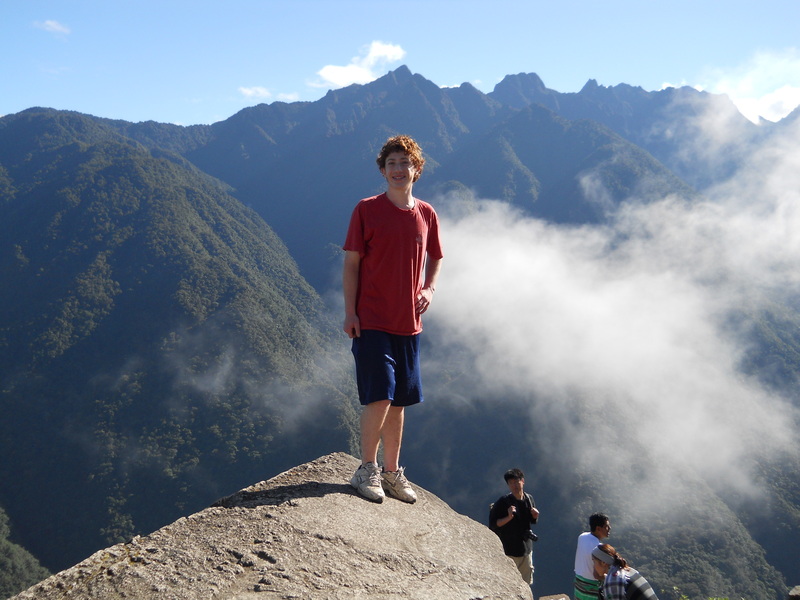 Huayna Picchu is the peak opposite Machu Picchu and affords incredible views of the site from high above. It is a steep hike, but not particularly long – we were up in about 45 minutes. There is so much written about the logistics of doing Huayna Picchu that it can be quite bewildering. Even with all the research, it is still quite confusing. And because most travelers spend only one night in Machu Picchu (which is sufficient), they get only one shot at doing the hike. So it is important to be very well prepared. And now that I’ve done it, at last all is clear. 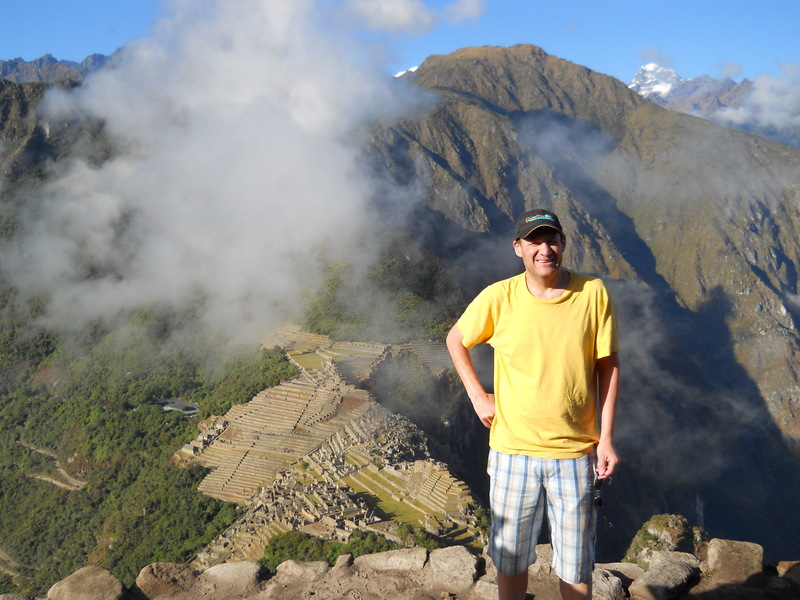 So here is my guide to climbing Huayna Picchu. Before I get on to specifics, here are two important notes to take into account. a. The town of Aguas Calientes/Machu Picchu township is the base for almost all travelers. It is reached either by the Inca Trail, or more commonly by train from Cusco or Ollantaytambo. It cannot be reached by car. It is very touristy with lots of hotels, sub standard restaurants and souvenir shops. From Aguas Calientes one reaches Machu Picchu itself by bus which takes about 15 minutes up a steep, windy road. Or you can hike up (about an hour). b. 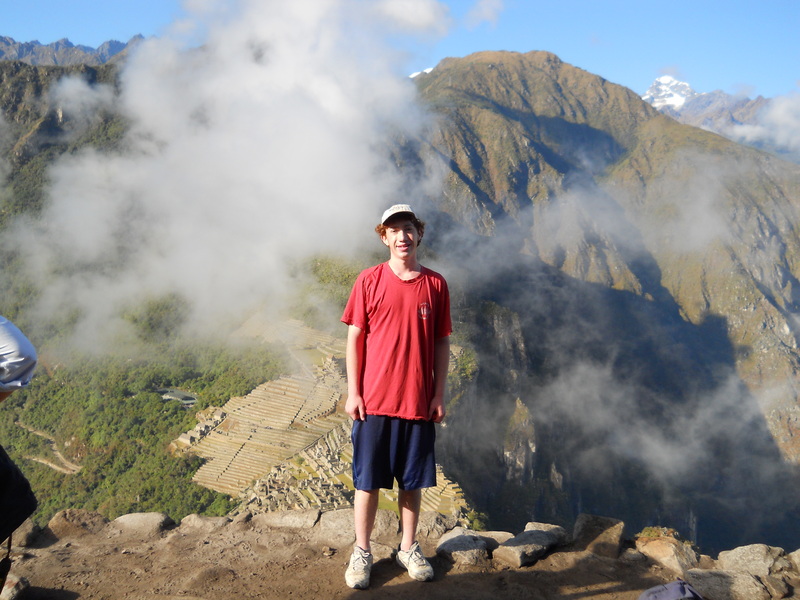 Each day, only 400 people are allowed up Huayna Picchu. This is the main reason one has to be very organised if you want to do this hike. 1. You must sleep in Aguas Calientes (Machu Picchu) town the night before. Or you could do the very expensive, luxurious option of staying at the Machu Picchu Sanctuary Lodge next to the site itself, a real treat, the only lodging right at the site, but very pricey (about $1,000 per night). It is however virtually impossible to arrive by train in Aguas Calientes in the morning and expect to climb Huayna Picchu that same day. 2. Bus tickets – these must be purchased at the ticket booth around the corner from where the busses line up. They can NOT be purchased on the bus itself. Return tickets cost a whopping $15.50 per person (visiting Machu Picchu is very expensive). It is advisable to buy the tickets the night before which we did. The ticket office is open late so it convenient and easy to purchase the bus tickets the night before. 3. Machu Picchu tickets – these can be purchased at the Machu Picchu Cultural Centre office on the main square of Aguas Calientes or in Cusco (INC office at Calle San Bernado). Tickets bought in Cusco MUST be used within three days of purchase. Tickets are very costly, at about $40, and are only valid for one day. There is a 50% discount for student card holders. You need to buy the tickets in Peruvian Soles, and in cash. Again, be prepared and buy the tickets in Aguas Calientes the night before the climb. Also, there is NO way to buy tickets up at Machu Picchu itself, so don’t go to the site without tickets – you’ll be turned away. Also, you HAVE to have your passport with you when you enter Machu Picchu. Please don’t make the mistake of buying all the tickets, getting to the site early, and then forgetting your passport! 4. 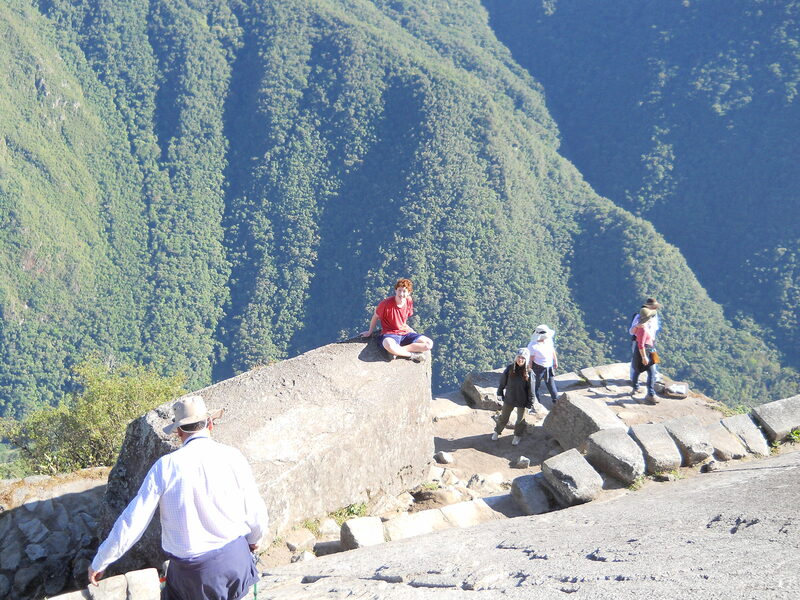 The 400 number: Each day only 400 people are allowed up Huayna Picchu. There are no exceptions. 200 go in the first stage between 7-8am, and the second group goes up between 10-11am. If you’re one of the 200/400, you’ll be very grateful for the limited number; if of course you were number 401, and someone must be, you’ll be cursing. 5. The buses start up for the site at about 5.25am. The site itself opens at 6am. However, because of the demand for places, you will need to be in line – at least in high season – by 4.30am. We were there by 4.20am and were about number 150 in line. If you want to just get to Machu Picchu early in order to see the sunrise, you can comfortably get to the bus stop at 5.30am. However, for Huayna Picchu, that’s much too late. If you’re in a group, one person could stand in line while others go get breakfast (most hotels start breakfast very early) or food. 6. Even with all the preparation in the world, when you actually arrive at Machu Picchu, you may feel overwhelmed and confused. The site may not yet be open and the crowds will feel immense, far more than one would guess from the (admittedly) long bus lines. The crowds will be boosted by people staying at the Sanctuary Lodge or others who have hiked up that morning. Either way, the crowd will be big! So when you get off the bus, GET INTO THE LEFT LINE which is the one for Huayna Picchu. That is not the time to dawdle, be distracted, go to the bathroom or anything else! Just get into that line! When you get to the little hut next to the main entrance, and if you’re in the first, lucky 400, you will get your stamp for Huayna Picchu. If, like us, there are still slots available for the 7am start, you will be offered a choice of going up at 7 or 10am. If the 200 spots for 7am have already been taken, you will be given a stamp for the 10-11am start. Your stamp will give you an hour in which to start (ours was 7-8am) and then you can actually relax – we only started at 7.35. So it’s a lot of work, but it’s well worth it. 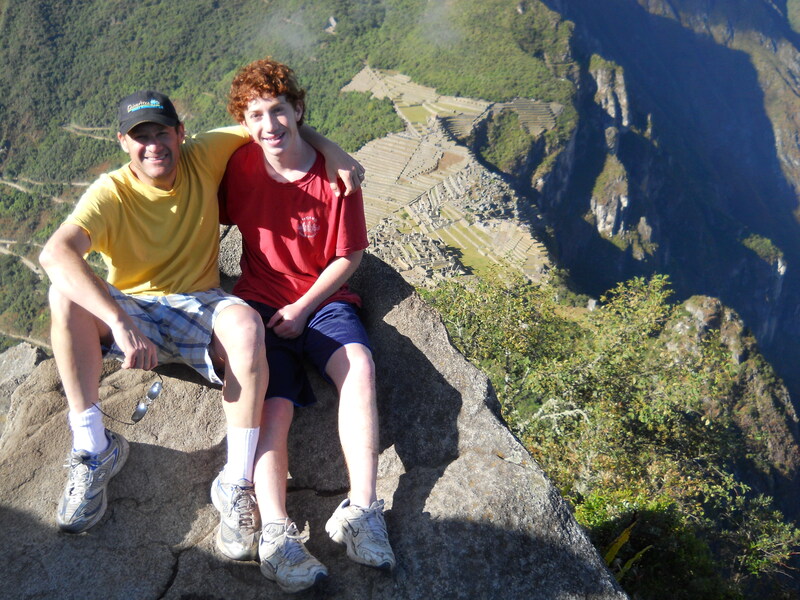 The views are spectacular, and you’ll be seeing a piece of Machu Picchu that only a select few get to experience. Try it!